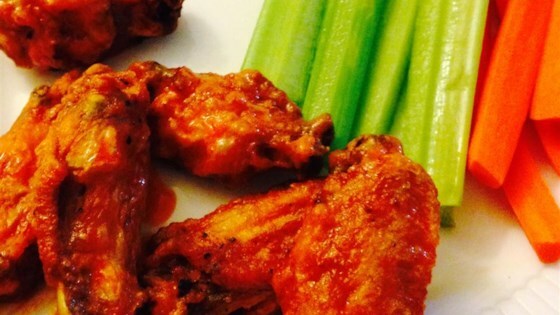 "Let your palate fly away on wings of fire - easy, spicy buffalo wings!" Heat the oil in a large skillet or deep fryer to 375 degrees F (190 degrees C). Deep fry chicken wings in oil until done, about 10 minutes. Remove chicken from skillet or deep fryer and drain on paper towels. Melt the butter in a large skillet. Stir in the, vinegar and hot pepper sauce. Season with salt and pepper to taste. Add cooked chicken to sauce and stir over low heat to coat. The longer the wings simmer in the sauce, the hotter they will be. Serve warm. Flavor is perfect. My suggestion is that the simmer time should be posted. Mild 15 minutes, Medium 30 min., Hot 45 minutes.